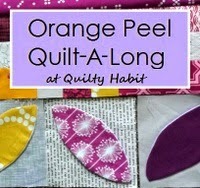 Just a little update before the Orange Peel QAL starts on Monday! I hope you are thinking about what you'd like to make. Remember, you have all summer to link up a project (until Sept. 8)! See the updated details, rules, and all other info for the QAL here. Just to give you a little bit of an incentive to participate, I've gathered some wonderful shops to sponsor prizes (thank you, shops! Much love!). Please visit their shops and thank them for sponsoring! These are shops I've purchased from repeatedly and have been extremely happy with. 1. Viewer's Choice - will open to everyone on September 9th, and the viewer's choice winner will be announced one week later with the other prizes. The winner of the Viewer's Choice category will win a fat quarter bundle of one of the colorways of Moonshine by Tula Pink, out this September, from The Intrepid Thread! The winner of the Quilts category will win a $25 gift certificate to Sew Me A Song! 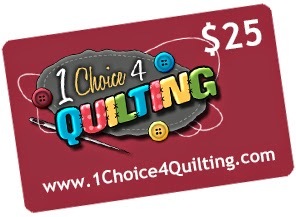 The winner of the "Just the Top" category will win a $25 gift certificate to 1 Choice 4 Quilting! 4. Minis (pillows, tablerunners, placemats, mini quilts, etc.) - shortest side must be less than 30"
The winner of the Minis category will win a $20 gift certificate to Westwood Acres! Is the link to the details and rules working? I just tried, and the page wouldn't open.